Last year, I was interviewed by one of my former colleagues at Groundwork Oldham & Rochdale, where I worked as a VPA in late 2012. I happened across the video yesterday, so I thought I’d share it here. The Groundwork VPA scheme is a three-month voluntary graduate scheme which enables graduates to gain invaluable experience in community, environmental, and social initiatives in the third sector. My time at Groundwork changed my life – without it, there’d be no Digging for Dementia! In the video, I talk a lot about Digging for Dementia and how the Groundwork VPA scheme gave me the skills to start the project, and I hope it helps people to better understand my background, and why I started Digging for Dementia. Enjoy! If you’re interested in finding out more about Groundwork Oldham & Rochdale and their VPA scheme, visit their website here, or follow them on Twitter. Tags: community, dementia, digging for dementia, groundwork, manchester, salford | Permalink. The next few weeks will hold some exciting developments for Digging for Dementia – the Ordsall Community Allotments are finished (and looking brilliant! ), the construction of the big Digging for Dementia raised bed will shortly be underway, and we’re almost ready to launch at the new site. The garden is ready to go, and now we need participants to join in the fun! I’m recruiting participants to join the new group, which is provisionally scheduled to launch on Saturday 31st May, 10.30am – 12pm. For details of how to get to the new site, see here. Ideally, I’d like a group of 8 – 10 people with dementia and their carers, and all are welcome, not just Ordsall residents. If you can get to the allotments, you’re welcome to join! The start date may change, depending on the construction of the raised beds, so if you would like to come along, please contact me on 07970 877 084 and let me know, so that I can keep you updated of any changes. Things are looking good for the scheduled launch date, and I really hope to see some of you there! If you know anyone who’d like to come along, please share this information with them, including the leaflet below. Thank you! Now that the frost has begun to thaw and the sunshine has made a triumphant return, Digging for Dementia is springing back into action. Although there have been no gardening sessions during the winter, I’ve been busy behind the scenes, preparing for DfD’s upcoming expansion to Ordsall Community Allotments, securing funding which will ensure the future of the project for a long time to come, and generally preparing for an exciting year ahead. With all that in mind, I wanted to share a quick update about all the recent goings-on. On New Year’s Eve, I reported that Digging for Dementia had been offered two additional allotment plots at the brand new Ordsall Community Allotment site. I’ve been working closely with Salford City Council and Ordsall Community Allotment Society to prepare to launch DfD at the site, and I’m so excited to be working alongside such a lovely bunch of people. The development of a strong sense of community is one of the key aspects of Digging for Dementia’s vision, and the wonderful group who run Ordsall Community Allotments will provide the perfect community-centred environment for the project. The new allotments are approximately three weeks away from completion, so I’ll soon be rolling up my sleeves to prepare the space for the new Digging for Dementia group. There are raised beds to build, tools to buy, and perhaps most importantly, the stash of teabags will need to be replenished! 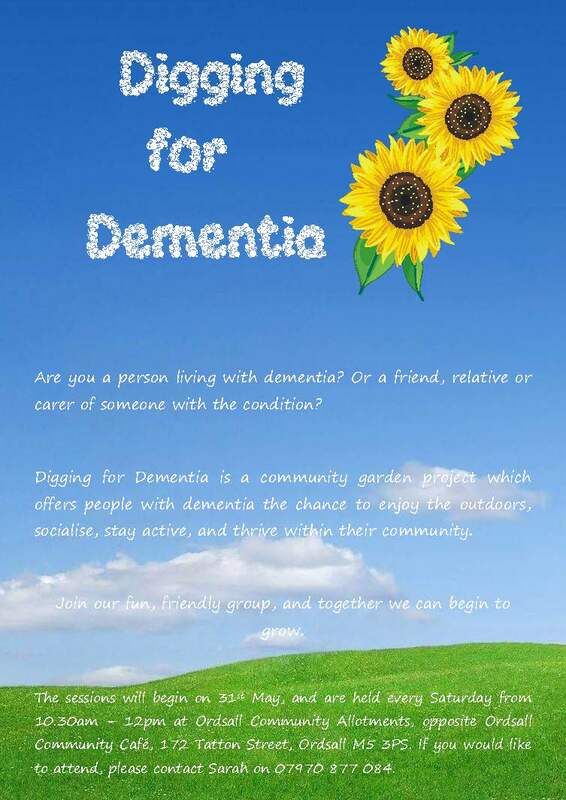 I’m hoping to begin recruiting participants in April, ready to launch the new site towards the end of May, but there’s a lot of work to be done, and I might need to call upon some of the ever-lovely Digging for Dementia supporters for assistance. If you’d like to volunteer in any way, please feel free to contact me. Over the coming weeks, I’ll be session planning, risk assessing, recruiting and marketing the hours away, so expect lots of updates regarding the development of the new site. It’s been a long time since our last practial session, and I’m very excited to stop planning and start digging again! Digging for Dementia is expanding by the day, and I can’t wait to get stuck in and watch the project continue to grow. I hope to see some of you at our brand new garden this year! Tags: community, dementia, digging for dementia, horticultural therapy, manchester | Permalink. My Grandma is one of my favourite people – her intelligence, independence and caring nature inspired me so much as a child, and now, as an adult, she continues to inspire me, albeit in a slightly different way. 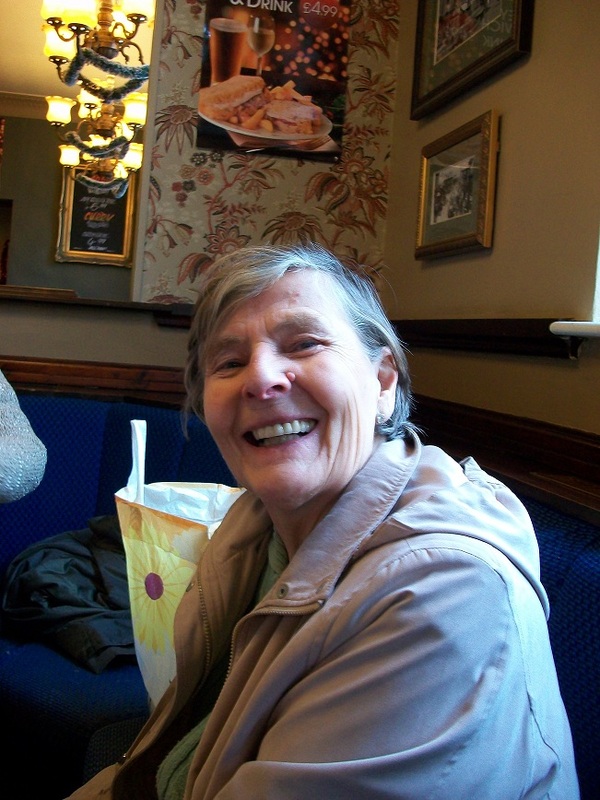 Alzheimer’s disease has all but robbed my family of the woman I grew up with, who took me to second-hand bookshops to fuel my love of reading, taught me how to do wordsearches, and knitted my baby clothes, but in spite of her illness, my Grandma remains intelligent, strong, and hilarious, and she never gives up. I started Digging for Dementia to make the world a better place for people like my Grandma, and to show society that people living with dementia are still entitled to, and capable of, living a full and happy life. Happy International Women’s Day to my Grandma and all the women like her, who lead by example and inspire those around them every single day. Tags: dementia, digging for dementia, international women's day, iwd2014 | Permalink.